We have been a proud participant in the International Villages Festival throughout the full year history of this event, and once again welcome all visitors to the Hungarian Village. 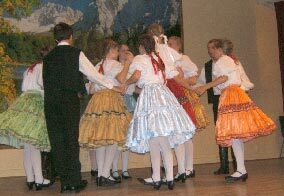 Sit back and enjoy a selection of lively, colourful and entertaining Hungarian music and dance presented by the CsÃ¡rdÃ¡s Dancers each evening, ranging from charming juniors to the fast paced and high energy performances of the Seniors. The Hungarian Hall on Albion St., has been the focal point for Hungarian immigrants who have arrived in Brantford and surrounding area for over seventy years. The club provides a variety of events throughout the year, which embrace tradition, and forge a link with our rich culture and heritage. Enjoy wonderful Hungarian cooking including mouth-watering chicken, cabbage rolls, sausage, paprika, or parsley potatoes. Also including delicious Langos this year! Specials of the day provide additional opportunity to tantalize your tastebuds.